Many lawyers I speak to have LinkedIn accounts. Several have gone so far as to start signing up to relevant groups. They then experience a deluge of updating emails spamming their inboxes notifying them every time something happens. The result is that many leave LinkedIn well alone for fear of being drowned in spam and mixed metaphors. Many do not realise that it is possible to manage (ie Switch Off) these notifications. This post shows you how. You set your own rules for how often you want to receive emails. When you join a group you will be taken to a screen that looks like this. You will have your own preferences and you might have different preferences for each group. On this group, for example, you will see that I have deselected the option to be notified every time someone starts a new discussion. This is the first circle I have marked. I have however chosen to receive a daily digest which I find helpful to keep me up to date with what is happening in the group. I have chosen a daily digest for this particular group because it is one that I find to be highly relevant to my work. I have some groups that are of less interest and I might select a weekly digest from the drop down box I have circled, or deselect this option so that I receive no updates at all. Choose your options and save changes. If you have already joined a group and want to change the settings then you can do so at any time. The next screen shows you how. 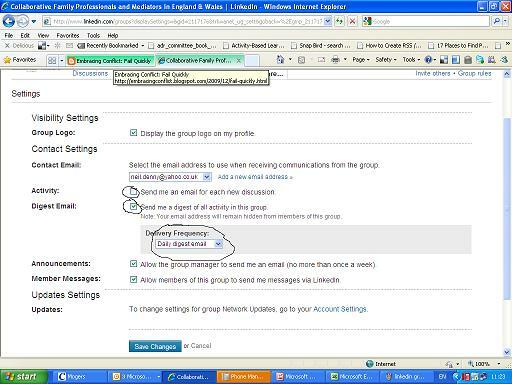 Changing email settings for groups you are already a member of. Select the relevant group from your list of groups. 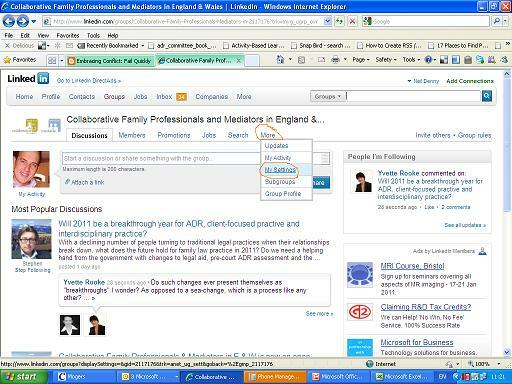 Click on where it says “More…” as circled above and the drop down menu will appear, as shown. Click on “My Settings” to get to the email preference screen seen in the first picture, change your settings and save those changes. Hopefully your use of LinkedIn groups will now be more enjoyable and you can control what emails you receive from which groups. Incidentally, if you comment on any discussion in a LinkedIn group then you receive an email everytime someone posts a comment after you. There is a tickbox on every discussion that you can mark to stop these updating emails being sent as well. Whoops, another tip I missed is this… You can get straight to the “Settings” page by clicking on the “Adjust your settings” link in small type at the very bottom of those emails. Again, that will take you to screen one, shown above.